Grafenwoehr and Vilseck volunteers were honored at a Volunteer Recognition Ceremony April 28 at Rose Barracks. Pictured here is the check symbolizing the value of their service. The total dollar amount for their labor would equate to $1,359,157.52. VILSECK, Germany — There are 460 of them among us here on-post and without them we are like a table missing a leg. They are busy at work. In just the last 12 months, they’ve logged 33 years’ worth of man hours. Over 240 on-post organizations currently use their services. And in the past year alone, the total dollar amount for their labor would equate to $1,359,157.52. On Thursday, April 28, they were recognized for their support and commitment at a ceremony here at the multipurpose center. Organized by the garrison’s volunteer program manager, Foy Dix and the staff at Army Community Service, the event drew a large crowd of both volunteers and the beneficiaries of their services. Photos of the event are available on the USAG Bavaria Flickr page. “Our community couldn’t do what it does,” Dix said to a boisterous, standing-room-only audience. Grafenwoehr and Vilseck’s volunteers leave a lasting impact on the operability and success of the services and programs made available through the garrison and community, according to Dix. They shoulder many of the responsibilities borne out of such services and programs dealing with children, religious services and sports — to name but a few. From March 1, 2015 to Feb. 29, 2016, Grafenwoehr and Vilseck’s 460 volunteers recorded 58,914 hours of service, said Kent Thompson, director of ACS. “The criticality of volunteers gets magnified during times of downsizing because there are things we as a garrison just can’t accomplish. Volunteers stand up and fill those gaps,” said Garrison Commander, Col. Mark Colbrook. And that’s no understatement. 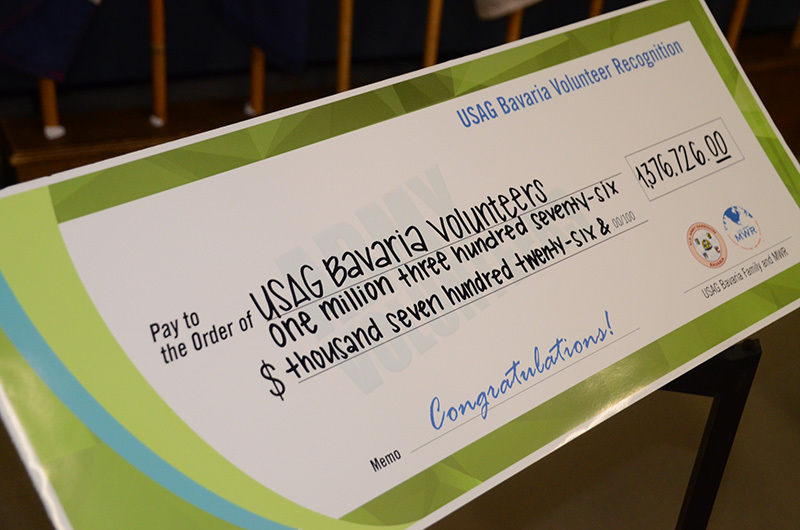 In the past two years, all volunteers at USAG Bavaria — to include installations at Grafenwoehr, Vilseck, Hohenfels and Garmisch — have logged more than 231,000 hours. Equate that to a monetary value and it comes out to over half a billion dollars saved.